NOTE:Through user feedback, we found that nuts are very fragile in use. We are very sorry.We have fixed the broken parts. And updated Amazon's warehouse goods.If you receive any imperfect product, please contact us. We will send you a brand one.oannao will do its best to serve its customers. We hope to be encouraged by everyone.We are always trying to make a perfect product.The progress of mankind needs constant innovation. I hope we have an tolerant attitude to newly growing creative products. Thank the buyer for the feedback of the real information. Q:I am really worried that the Wireless Charger Car Mount will automatically open in the course of driving, which ends up dropping the cell phone. A:The first generation of Wireless Charger Car Mount uses an electrostatic touch button.If the weather is dry,it may produce static electricity ,which causes itself to open automatically and the cell phone falls.If that kind of situation does happen,it's extremely unsafe during the driving process. The second generation is upgraded. We put on a physical button on the original version.So, the Wireless Charger Car Mount only open automatically by pressing the button arm. As a result,problem solved. Q:I always like to use the protection shell, can my phone be charged with a shell? A:Of course you can,but the charging conversion rate will be reduced by about 15%, and it is recommended not to use a shell which is too thick. Otherwise the wireless charging car mount can not fully grip the phone. There are hidden dangers which is the phone falling out. Note: Do not charge the phone with a metal-made protection shell. THREE INSTALLATION WAYS： two kinds of car mount are provided, and they can be stalled in three different ways: a-windshield installation, B-driving-platform installation, C-air outlet installation. The universal rotary ball,with360 degree of freedom rotation.It can be used at any angle, which brings a flexible range of viewing angle. Movable 3M strong rubber chassis is firmly stuck to the windshield or driving-platform,which solves the problem of automatic shedding according to users' feedback. 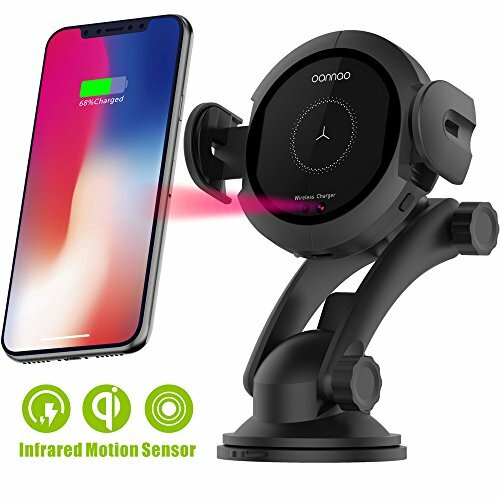 ENVIRONMENTAL PROTECTION MATERIALS：wireless charger car mount adopts German-imported environmental protection materials, which has passed FCC and Rohs certification. We have thought through this kind of scenario: in the summer, the wireless charger car mount installed in the car is exposed to sunlight. Environmental material is nontoxic and unscented. FRIENDLY CUSTOMER SERVICE: Dear friends, If you buy a wireless charger car mount with quality problems within one month,we will pay back all.Of course, you can ask for a new one. Within one year quality if there are any problems, providing warranty service. Please believe that we can give you a friendly customer service. If you have any questions about this product by oannao, contact us by completing and submitting the form below. If you are looking for a specif part number, please include it with your message.